McGregor, J. & Hay, L. (eds.) (2006). CSTL Research Retreat Proceedings. Wagga Wagga, NSW: Centre of Information Studies, Charles Sturt University. Henri, J. , Hay, L. & Oberg, D. (2002). The School Library-Principal Relationship: Guidelines for Research and Practice. IFLA Professional Reports Series: No. 78. The Hague, Netherlands: International Federation of Library Associations and Institutions. Hay, L., Hanson, K. & Henri, J. (eds.) (2001). New millennium, new horizons. Information services in schools 2000 online conference proceedings. Centre for Studies in Teacher Librarianship, Charles Sturt University. Hay, L. & Henri, J. (eds.) (2000). Enter the millennium. Information services in schools 1999 online conference proceedings. Wagga Wagga, NSW: Centre for Studies in Teacher Librarianship, Charles Sturt University. Hay, L. & Henri, J. (eds.) (1999). The Net effect: School library media centers and the Internet. Lanham, Maryland: Scarecrow Press. Hay, L. & Henri, J. (eds.) (1998). A meeting of the minds 2: ITEC virtual conference ‘97 proceedings. Belconnen, ACT: ASLA Press. Hay, L. & Henri, J. (eds.) (1996). A meeting of the minds: ITEC virtual conference ‘96 proceedings. (eds.) Belconnen, ACT: ASLA Press. Gregory, S., Willems, J., Wood, D., Hay, L., Ellis, A., & Jacka, L. (2013). Learning and teaching in Second Life: Educator and student perspectives. In B. Tynan, J. Willems & R. James (Eds. ), Outlooks and opportunities in blended and distance learning (pp. 220-242). Hershey, PA: Information Science (IGI Global). Hay, L. (1999). Information policy issues: Curse or cure? In Hay, L. and Henri, J. (eds.) The Net effect: School library media centers and the Internet. Lanham, MD. & London: Scarecrow, 160-174. Hay, L. (1999). Innovations in online assessment – Case study 2. Joining a volunteer online support service. In Morgan, C. and O’Reilly, M. (eds.) Assessing open and distance learners. London: Kogan Page. Hay, L., Henri, J. and Oberg, D. (1999). The role of the principal in an information literate school community: Think global, act local. In Henri J. and Bonanno K. (eds). 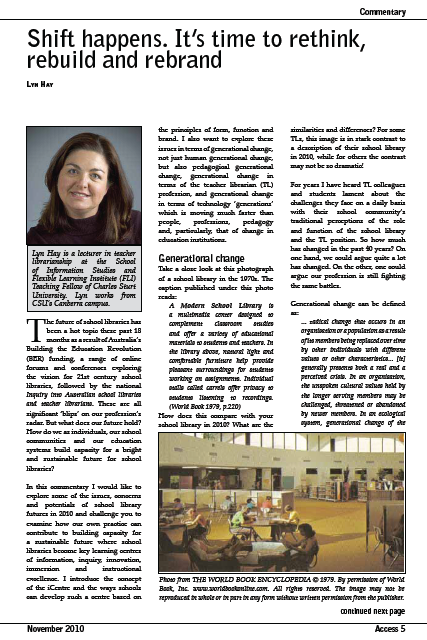 (1999) The information literate school community: Best practice. Wagga Wagga: CIS, 119-144. Hay, L. (2015). Celebrating the achievements of our profession [Editorial]. Learning Hub, 3 (Winter), 3. Hay, L. (2015). Introducing… Martin Gray. Learning Hub, 3 (Winter), 12. Hay, L. (2015). What you need to know about FAIR – Freedom of Access to Information and Resources. Learning Hub, 3 (Winter), 14-15. Hay, L. (2015). Literacy, picture books, The Brothers Quibble and more! Learning Hub, 3 (Winter), 20-23. Hay, L. (2015). Get connected and build your PLN [Editorial]. Learning Hub, 2 (Autumn), 3. Hay, L. (2015). Introducing… Shannon McClintock Miller. Learning Hub, 2 (Autumn), 19. Garrison, K., & Hay, L. (2015). Using international literature to support the development of global perspectives and intercultural understandings in teachers and students. Learning Hub, 2 (Autumn), 14-18. Hay, L. (2014). A sense of belonging [Editorial]. Learning Hub, 1 (Summer), 3. Hay, L. (2014). Introducing… Carol Gordon. Learning Hub, 1 (Summer), 13. Morris, B., & Hay, L. (2012). Building a school based professional learning network. [Refereed] Scan, 31(2), 24-35. Hay, L., & Pymm, B. (2010/2011). Real learning in a virtual world: A case study of the School of Information Studies’ Learning Centre in Second Life. [Refereed] Education for Information, 28(2-4), 187-202. Hider, P., Kennan, M.A., Hay, L., McCausland, S. & Qayyum, A. (2011). Moving from LIS to IS+L: Curriculum renewal at Charles Sturt University. [Refereed] Australian Library Journal, 60(3), 205-217. Hay, L., & Todd, R. (2010). School libraries 21C: The conversation begins. [Refereed]. Scan, 29(1), 30-42. Hay, L. (2010). Shift happens. It’s time to rethink, rebuild and rebrand. [Commentary]. Access, 24(4), 5-10. Hay, L., & McGregor, J. (2010). CSU’s Second Life. inCite, 31(1/2), 19-20. Hay, L., & Foley, C. (2009). 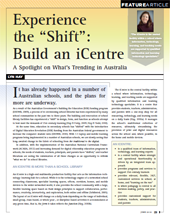 School libraries building capacity for student learning in 21C. [Refereed]. Scan, 28(2), 17-26. Hay, L. (2007). Combining skills and interests: Pathways to becoming a teacher-librarian. Career Education Association of Victoria (CEAV) Careers Journal, 35(2). Hay, L. (2007). Making it happen: Shaping our profession for the future. FYI, 11(3), 25-28, 36. Foley, C. & Hay, L. (2007). Shaping our profession: Teacher librarianship into the future. Scan, 26(3), 21-27. Hay, L. (2007). CSU helps shape our profession. Scan, 26(3), 44. Hay, L. & Eyre, G. (2005). Smart information use: An exploration of research and practice. [Refereed]. Access, 19(2), 27-30. McGregor, J. & Hay, L. (2003). Formalising your professional learning journey. FYI, 7(4), 12-14. Henri, J., Hay, L., & Oberg, D. (2002). An international study on principal influence and information services in schools: Synergy in themes and methods. [Refereed]. School Libraries Worldwide, 8(1), 49-70. Hay, L. (2001). Information leadership: Managing the ICT integration equation. [Refereed]. Computers in New Zealand Schools, 11(3), 5-12. Oberg, D., Hay, L. & Henri, J. (2000). The role of the principal in an information literate school community: Design and administration of an international research project. [Refereed]. School Library Media Research. Vol. 3. Oberg, D., Hay, L. and Henri, J. (2000). The role of the principal in an information literate school community: Cross-country comparisons from an international research project. [Refereed]. School Library Media Research. Vol. 3. Hay, L. (1999). Information power: Building partnerships for learning and information literacy standards for student learning. A review essay. Journal of Youth Services in Libraries, 12(2), 43-45. Hay, L. (1999). Online conferencing: Realising the potential for the delivery of professional development. Information Searcher, 11(4), 1,3-8. Hay, L. & Hanson, K. (1999) Rethinking literature circles: Reading and rolemaking in a virtual classroom environment. [Refereed]. Orana: Journal of School and Children’s Librarianship, 35(3), 17-31. Hay, L. (1998). An interview with Jamie McKenzie. Scan, (17)2, 5-7. Hay, L. (1998). Online delivery in distance education: Enhancing student learning experiences through collaborative practices. Education for Library and Information Services: Australia, 15(3), 119-132. Henri, J. & Hay, L. (1998). Information literate school communities: Research into principal support. [Refereed]. Access, (12)3, 29-31. Hay, L. (1997). OZKidsConnect: Teacher-librarians supporting kids using the Internet. Teacher & Librarian, 128, 8-11. Hay, L. & Dillon, K. (1997). OZTL_NET electronic network: Participate, motivate, educate. Access, 11(2), 19-22. Henri, J. & Hay, L. (1997). Teacher librarian nomenclature. In ‘Research Columns 4’. [Refereed]. Scan, 16(4), 47-52. Henri, J., Hay, L. & Hughes, S. (1997). Teacher librarians claiming their territory in cyber-space: the 1996 ITEC Virtual Conference. School Libraries Worldwide, 3(1), 55-60. Hay, L. & Henri, J. (1996). Teacher librarians break virtual ground: the ITEC virtual conference. Scan, 15(3), 39-40. Henri, J. & Hay, L. (1996). Principals are leaders. Teacher librarians can be too! Access, 10(2), 8-10, 41. Henri, J. & Hay, L. (1996). TLs and the Internet: Here come the cyberarians! School Libraries in Canada, 16(3), 19-20. Henri, J. & Hay, L. (1996). TLs and the Internet: Opportunities for professional development. Access, 10(3), 10-12. Henri, J. & Hay, L. (1995). Teacher librarians must be principally minded. School Libraries in Canada, 15(4), 25-26. Pymm, B., & Hay, L. (2013). ‘Using Etherpads as platforms for collaborative learning in a distance education LIS course’. [Refereed paper & poster presentation] Scholarship in Action: Data – Innovation – Wisdom. iConference 2013. 12-15 February, Fort Worth, Texas. Gregory, S., Gregory, B., Hillier, M., Jacka, L., Schutt, S., Ellis, D., Stokes-Thompson, F., Wood, D., Masters, Y., Farley, F., Orwin, L., Stupans, I., Scutter, S., Warren, I., Steel, C., Neuendorf, P., Bower, M., Miller, C., Mathews, S., Butler, D., Hearns, M., Garcia, J., Jegathesan, J.J., Brown, R., Meredith, G., Muir-Cochran, E., Flintoff, K., Grant, S., Atkins, C., Gaukrodger, B., Giovanangeli, A., Le Rossignol, K., Larson, I., Cram, A., Linegar, D., Wang, X., Muir, T., Cleland, B., Paillat, E., Grenfell, J., Hay, L., Gu, N., Anthony Williams, A., Simoff, S., Bogdanovych, A. & McCarthy, A. (2012). Sustaining the future through virtual worlds. In M. Brown, M. Hartnett & T. Stewart (Eds. ), Future Challenges – Sustainable Futures. Proceedings ascilite Wellington 2012 (pp. 361-368). Wellington, New Zealand: Massey University and ascilite. Hay, L. (2012). ‘Do we need to use a wiki, Miss?’ – Student choice and preference for using technologies to support learning. 16th International Research Forum on School Librarianship, 41st Annual Conference of the International Association of School Librarianship (IASL) Conference Proceedings. 11-15 November, Doha, Qatar. Gregory, B., Gregory, S., Wood, D., Masters, Y., Hillier, M., Stokes-Thompson, F., Bogdanovych, A., Butler, D., Hay, L., Jegathesan, J. J., Flintoff, K., Schutt, S., Linegar, D., Alderton, R., Cram, A., Stupans, I., McKeown-Orwin, L., Meredith, G., McCormick, D., Collins, F., Grenfell, J., Zagami, J., Ellis, A., Jacka, L., Campbell, J., Larson, I., Fluck, A., Thomas, A., Farley, H., Muldoon, N. I., Abbas, A., Sinnappan, S., Neville, K., Burnett, I., Aitken, A., Simoff, S., Scutter, S., Wang, X., Souter, K., Ellis, A., Salomon, M., Wadley, G., Jacobson, M. J., Newstead, A., Hayes, G., Grant, S., & Yusupova, A. (2011). How are Australian higher education institutions contributing to change through innovative teaching and learning in virtual worlds? In G. Williams, N. Brown, M. Pittard, & B. Cleland (Eds), Changing demands, changing directions. Proceedings of the 28th ASCILITE Conference. [Refereed] Hobart, Australia: University of Tasmania, pp.475-490. Crease, R., Pymm, B, & Hay, L. (2011). Bridging the gap – engaging distance education students in a virtual world. In G. Williams, N. Brown, M. Pittard, & B. Cleland (Eds), Changing demands, changing directions. Proceedings of the 28th ASCILITE Conference. [Refereed] Hobart, Australia: University of Tasmania, pp.307-313. Hay, L., & Pymm, B. (2011). Real Learning in a Virtual World: A Case Study of the School of Information Studies’ Learning Centre in Second Life. [Refereed] Paper presented at the Asia-Pacific Conference on Library & Information Education and Practice (A-LIEP): Issues, Challenges and Opportunities, 22-24 June 2011, Putrajaya, Malaysia. Gregory, S., Willems, J., Wood, D., Hay, L., Ellis, E. & Jacka, L. (2011). Learning and teaching in Second Life: Educator and student perspectives. [Refereed]. Education 2011 – 2021: Global challenges and perspectives of blended and distance learning. DEHub Summit Proceedings, Sydney, 15-18 February 2011. Gregory. S., Lee, M.J.W., Ellis, A., Gregory, B., Wood, D., Hillier, M., Campbell, M., Grenfell, J., Pace, S., Farley, H., Thomas, A., Cram, A., Sinnappan, S., Smith, K., Hay, L., Kennedy-Clark, S., Warren, I., Grant, S., Craven, D., Dreher, H., Matthews, C., Murdoch, D., McKeown, L. (2010). Australian higher education institutions transforming the future of teaching and learning through virtual worlds. [Refereed]. In C. Steel, M.J. Keppell & P. Gerbic (Eds), Curriculum, technology & transformation for an unknown future. Proceedings ascilite Sydney 2010. Hider, P., Kennan, M., Hay, L., McCausland, S., & Qayyum, A. (2010). Moving from LIS to IS+L: Curriculum Renewal at Charles Sturt University, Australia. In Cooperation and Collaboration in Teaching and Research: Trends in Library and Information Studies Education, International federation of Library Associations (IFLA) and European Association for Library & Information Education and Research) (EUCLID) Satellite Meeting, 8-9 August, Borås, Sweden. Hay, L. (2006). Are Internet–savvy kids@home the new information poor? Rethinking the digital divide. [Refereed]. Visions of Learning: ASLA Online II Conference Proceedings – May 2006, Australian School Library Association Inc., Zillmere, Qld. Lee, M.J.W., Eustace, K., Hay, L. & Fellows, G. (2005). Learning to collaborate, collaboratively: An online community building and knowledge construction approach to teaching computer supported collaborative work at an Australian university. [Refereed]. Association for Educational Communications and Technology 2005 International Convention, Orlando, FL, October 18-22. Hay, L. (2004). 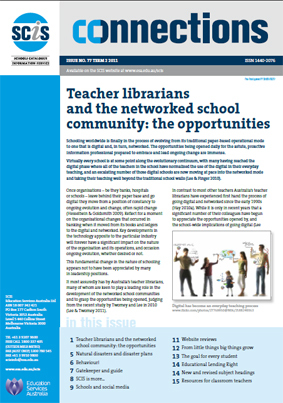 Communicate, collaborate, consolidate: Teacher librarianship education and the profession. ASLA Online I: Constructing communities of learning and literacy conference, 15-31 May. Henri, J., Hay, L. & Oberg, D. (2002). The role of the principal in an information literate school community: Findings from an International Research Project. School Libraries Section, 68th IFLA Council and General Conference, August 18-24. Hay, L. (2001). Defining our reality: The future of the profession, the power of the individual. In Hay, L., Hanson, K. and Henri, J. (eds.) New millennium, new horizons. Information services in schools 2000 online conference proceedings. Wagga Wagga, NSW: Centre for Studies in Teacher Librarianship, Charles Sturt University, 3-16. Hay, L. (2001). Groupware: Supporting knowledge management in schools. Forging future directions, Australian School Library Association XVII Biennial Conference, Twin Waters Resort, Sunshine Coast, Qld, 1-4 October. Hay, L. & Eustace, K. (2001). Groupware as a knowledge management tool: Possibilities for schools. In Hay, L., Hanson, K. & Henri, J. (eds.) New millennium, new horizons. 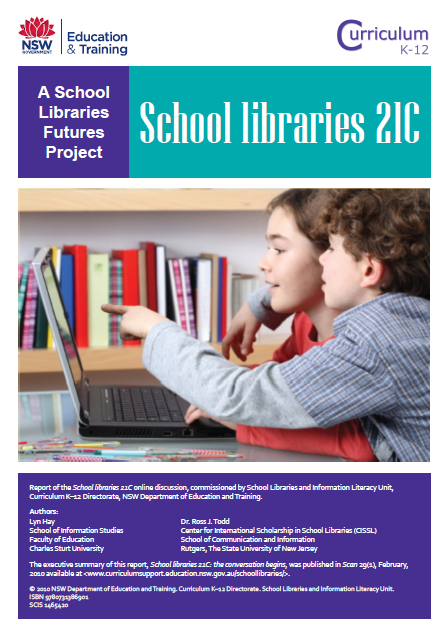 Information services in schools 2000 online conference proceedings. Wagga Wagga, NSW: Centre for Studies in Teacher Librarianship, Charles Sturt University, 26-39. Eustace, K. & Hay, L. (2000). A community and knowledge building model in computer education. Proceedings of the Fourth Australasian Computing Education Conference, 4-6 December. [Refereed] Monash University, Melbourne, 4-6 December, 95-101. Hay, L. (2000). Online conferencing: Where professional development and ICTs collide. In Hay, L. & Henri, J. (eds.) Enter the millennium. 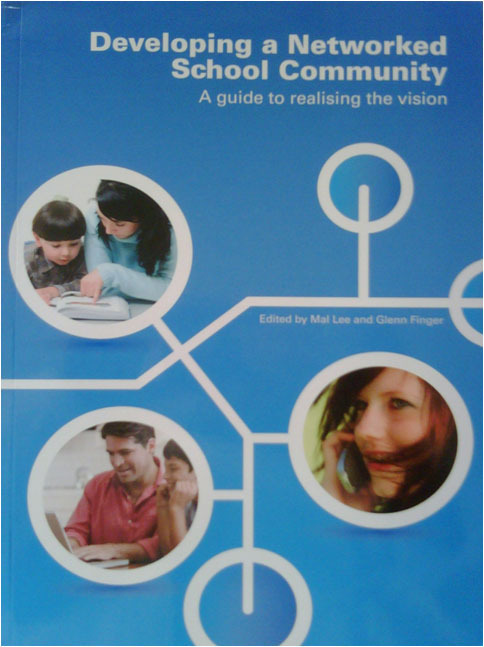 Information services in schools 1999 online conference proceedings. Wagga Wagga, NSW: Centre for Studies in Teacher Librarianship, Charles Sturt University, 3-15. Oberg, D., Hay, L. & Henri, J. (1999). The role of the principal in an information literate school community: Findings from an international research project. In Lighthall, L. and Howe, E. (eds.) (1999). Unleash the power! Knowledge – Technology – Diversity: Papers presented at the Third International Forum on Research in Teacher Librarianship. [Refereed] Seattle, WA: IASL, 163-178. Hay, L. (1998). Information policy issues: Curse or cure? In ‘A Meeting of the Minds 2: ITEC Virtual Conference ’97 Proceedings. Information Services Strand, 25 April-11 May 1997.’ Belconnen, ACT: ASLA Press, 160-174. Hay, L, Henri, J. & Oberg, D. (1998). The principal’s role in developing information literacy: Findings from Australia and Canada. In Education For All: Culture, Reading and Information. Papers presented at the 27th Annual Conference for the International Association of School Librarianship. [Refereed] Bar-Ilan University, Ramat-Gan, Israel, 5-9 July. Hay, L, Henri, J. & Oberg, D. (1998). The role of the principal in an information literate school community: an international panel. Administration of an international research project. Session 158B: School Libraries and Resource Centres Research Forum, 20 August, 1998 at IFLA’98 Annual Conference, Amsterdam, Netherlands. Hay, L. & Dillon, K. (1998). OZTL_NET: Communicating, participating, motivating… In Hay, L. and Henri, J. (eds.) A Meeting of the Minds 2: ITEC Virtual Conference ’97 Proceedings. Information Services Strand, 25 April-11 May 1997. Belconnen, ACT: ASLA Press, 273-283. Henri, J. & Hay, L. (1997). Understanding principal patronage: Developing and piloting a quantitative instrument. Paper presented at Section for School Libraries and Resource Centres at IFLA’97 Annual Conference, Copenhagen, Denmark, 31 August – 5 September. Henri, J. & Hay, L. (1997). Teacher Librarian: What’s in a name? Making meaning from metaphor. In Information Rich but Knowledge Poor? Emerging Issues for Schools and Libraries Worldwide. Research and Professional Papers presented at the 26th Annual Conference for the International Association of School Librarianship held in conjunction with the Association for Teacher-Librarianship in Canada. [Refereed] Vancouver, British Columbia, Canada, 6-11 July, 329-334. Hay, L. & Henri, J. (1996). Sustaining the vision through networking… (and a few challenges too!). In Sustaining the Vision. Selected Papers from the 24th Annual Conference of the International Association of School Librarianship. [Refereed] Worcester, England, 17-21 July. Henri, J. & Hay, L. (1996). ‘The principal’s role in developing and supporting an information literate school community.’ In Beyond the horizon: conference proceedings of the fourteenth biennial Conference of the Australian School Library Association, Esplanade Hotel, Fremantle, Western Australia 1-5 October 1995. West Perth, WA: Australian School Library Association (ASLA), 111-125. Hay, L. & Henri, J. (1995). Leadership for collaboration: Making vision work. Paper presented for International Federation of Library Associations (IFLA) School Libraries Section at the 61st Annual General Conference, Istanbul, Turkey, August. Henri, J. & Hay, L. (1994). Beyond the bibliographic paradigm: User education in the Information Age. Paper presented for IFLA User Education Round Table, Division III Proceedings Booklet for the 60th Annual General Conference, Havana, Cuba, August.